Fresh fruit from the farmers’ market or field is irresistible. I keep bringing home quantities that normally transform into jam, only to be slammed with a new deadline at work. The fruit sits, patiently ripening on the table. My pantry will suffer down the road but the excess fruit has allowed quite a few experiments with roasted fruit condiments and rustic fruit desserts, not to mention the melons and peaches and plums and berries and figs introduced to our salads of greens and herbs. It’s been a good summer after all. Last weekend I picked the last blueberries and the first raspberries. (Since raspberries are a two-season crop, I picked the last raspberries and first blueberries earlier in the summer.) What I had on hand was perfect for a tart, cooked in a 4 x 10 inch fluted tart pan with a removable bottom, a spur-of-the-moment splurge that I now find incredibly useful. My favorite way to make blueberry filling for a tart is to boil a few berries with sugar, water and thickener to make a jam, cool it and fold in fresh berries. The cooked fruit is a binder for the raw. Tinged with lemon and topped with raspberries, the blueberries are refreshing. Place ½ c berries, sugar and 1/3 cup water in a saucepan and bring to a boil. In a small covered jar, shake the cornstarch and1 tbsp water to combine into a slurry (or stir together thoroughly in a small bowl). Add slowly to the berry mixture, stirring to avoid lumps and cooking for a few minutes until the berries pop and the mixture becomes thick. Set aside to cool. 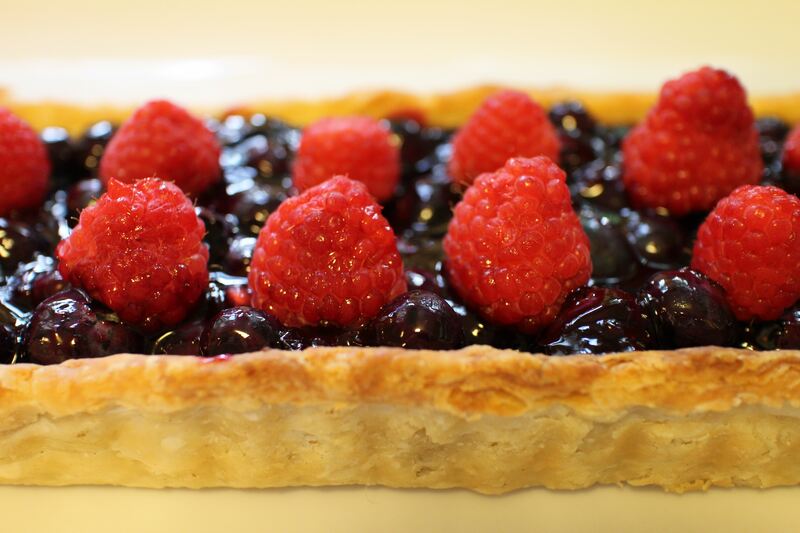 Add the lemon juice and the balance of the berries and spoon into a pre-baked (and cooled) tart shell. Arrange the raspberries on top. Serve as is or sprinkle with sifted confectioners sugar just before serving. Place the flour, salt, sugar and butter in a food processor and pulse a couple of times until the mixture is crumbly. With the motor running, quickly add 1/3 c of ice water and turn off motor immediately. Pour the mixture into a shallow bowl and add additional ice water, a few sprinkles at a time, until the dough holds together. Do not over mix. Divide the dough in half and place each half in plastic wrap in the refrigerator (which will relax the gluten) for at least 1 hour. Preheat the oven to 400 degrees. Roll out the dough on a floured board (also flouring the rolling pin) and place it into a fluted tart pan. Run the rolling pin across the top of the pan to level the edges. Prick the bottom of the shell with a fork, line it with foil and add dried beans (I’ve used the same ones over and over for years) or pie weights. Bake the tart shell for 10 minutes, remove the foil and beans and bake for about another 10 minutes until just browned. Remove to cool before adding the cooked and cooled filling.